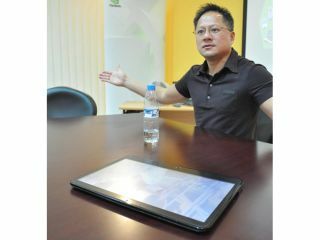 A mysterious tablet PC is being shown off by Nvidia, apparently sporting the Tegra platform. According to Engadget, the device is a Tegra prototype from an original design manufacturer called Innovative Converged Devices, and is being sent to carriers around the world. The apparent target is for the device to ship in the first quarter of next year, and possibly with T-Mobile as well - although that would likely be in the US and doesn't mean it will hit the same network in the UK. The prototype is running Windows CE, according to the rumours, and is only coming with a sad resistive screen. However, Android versions with capacitive screens are in the works, with the recent Android 1.6 update offering allowing larger screen sizes and resolutions to be supported. We'd rather this was the fabled Apple tablet - not least because it would put to bed the rumours of the thing which are threatening to become more annoying the 'next year's iPhone'.